Today, we have sad news to tell you. Our sweet Bella has passed on due to bone cancer that she developed last year. We were taking her for treatments to a renowned cancer specialist here in Southern California and while the treatments made her more comfortable and lengthened her life, she has now succumbed to this terrible disease that affects so many of Gods beautiful creatures. Brave girl that she was, she never complained or whimpered once that we can remember, even on the morning she broke her leg getting out of bed. But, we knew then that it was all the time we were going to get with her. She was the brightest light in our life and she really did love sharing her adventures with everyone. I think you can see it in her movies, especially how friendly and gentle she was with the people she met. Her sweetness and loving nature was infectious, especially with kids, who would surround her wherever we went. She’d just sit there and let them pet her and talk to her like she was one of them. She just loved all the attention. Bella was my service dog, so writing this is especially hard, because our bond was pretty unique. 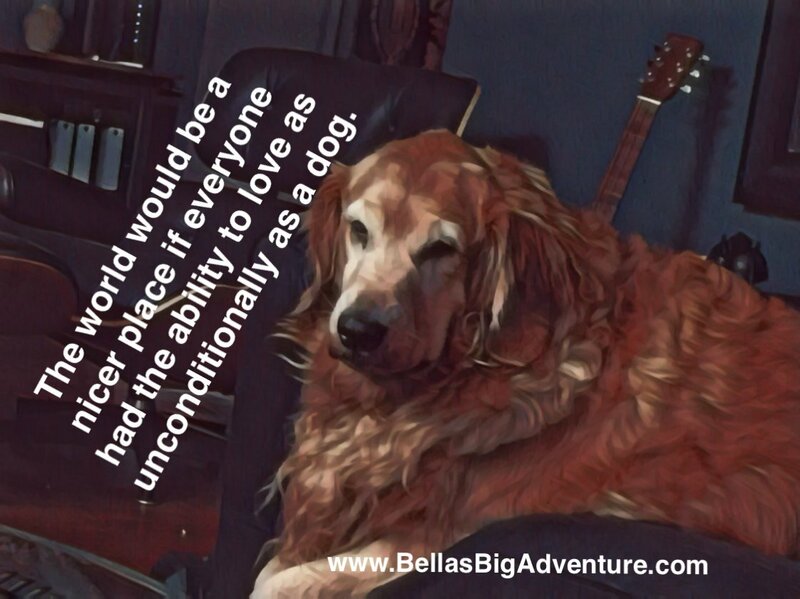 Untrained as a service dog until later, Bella figured out before I could, when I was going to have a flare up from my diverticulitis and would nudge my belly with her nose. Then one day she sat in front of me and barked like crazy. Twenty minutes later I was at the hospital with a heart attack. It was emotionally overwhelming to realize that my dog was not just my companion, but was actually taking care of me. She eased my anxiety and fear over my health issues so much that I was able to start working and traveling again. Over the next year, we went through the process of having her trained to be my service dog. Bella quite literally gave me my life back and saved it a time or two as well. Playful to the end, Bella had a really hard time not being able to run around with the puppies the last few months. We’ve had to keep them mostly separated as the girls have been growing up, especially outside. Our fear was that Bella’s fragile bones couldn’t take it. So, while you haven’t seen it, she’s been nurturing and playing mom to the two puppies that we adopted last October. If anyone ever suggests to you that puppy siblings might be tough to raise, take him or her seriously! Bella’s been a good teacher and a huge help in calming the sisters down. Just in case anyone was wondering, acting doesn’t come naturally to dogs, so calmness and an eagerness to learn and take instruction really helps. These also happen to be great qualities for service dogs. Bella was a huge star, in my opinion. She could and would do anything I asked of her. Her vocabulary was huge and she also loved showing off. As an actor, she could improv with the best of them. We were remembering one time that I wanted her to walk in front of a painting in the National Gallery of Art. Well, being Bella, she didn’t just walk in front of the painting, instead she slowed down as she approached the painting, stopped, sat down and looked up at the painting, pondered it for a moment and then got up and finished walking across the room. She always said that she loved art! I don’t know about that, but the tranquility of museums sure seemed to make her happy. Bella has brought much joy and adventure into our lives and I hope yours. We’ve received so much love and done so many things with this little doggie that we can’t really be sad. While the loss is difficult, I know Bella would want all of us to think of her only as the beautiful loving creature that she was. Her mission in life was to save me, so I have made sharing her view of life with as many people as we can, my mission. We think Bella’s outlook on life would make a lot of people in the world happier today and who couldn’t use a little more happiness in this world. P.S. Lil’ Bella and Lola are also really upset about losing their Auntie Bella. They can’t wait to set out on their own big adventures and prove to their Auntie that their worthy of taking over her blog, but it’ll have to wait until they stop walking around the house looking for her. I’m so sorry for your loss. 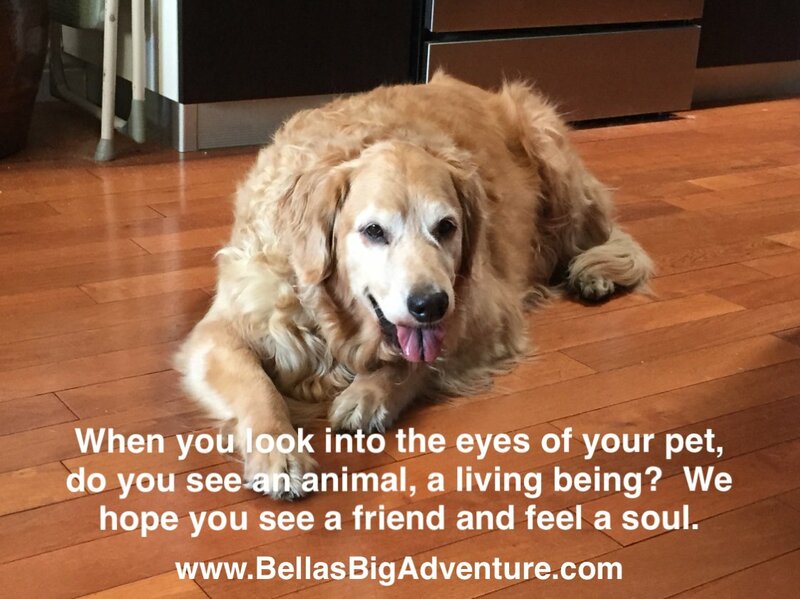 Beautiful Bella had a wonderful life with you. 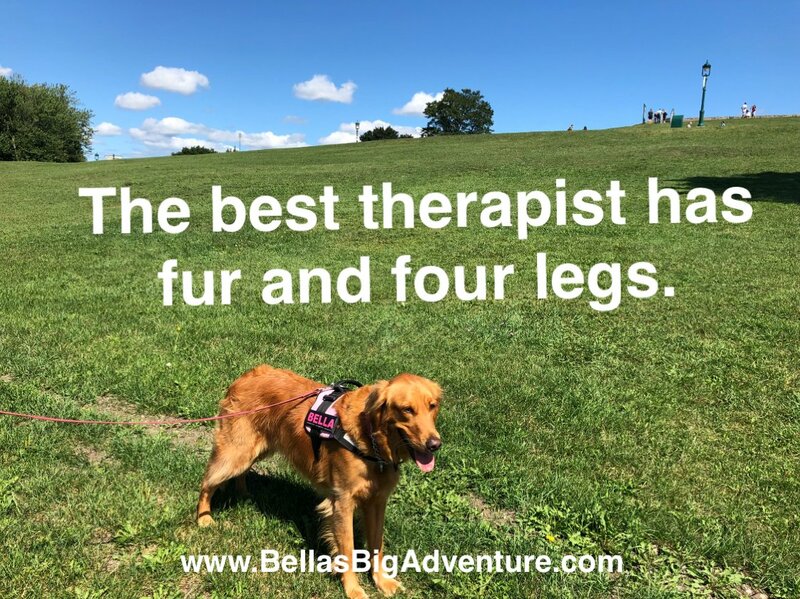 Thank you and Bella for sharing your adventures with us. May Bella always be in your hearts like she will always be in mine. I really enjoyed watching Bella. I just wondered if she was still around and came here. I’m sorry to see that she passed. My mom was just getting out of the hospital when Bella passed – she’d been in there for 2 months and we almost lost her! She is home now and I’m taking care of her and our 14 1/2 year old blue roan cocker, Katey. Anyway, I’ll sure miss Bella. Thank you so much for your sweet message. Bella was my service dog, so we were especially close and her loss continues to be difficult. It’s amazing to see how many other people she touched through our blog. We now have a couple of year old puppies, one of whom will become my service dog in another year or so. They are just getting started on their adventures and we sure hope you and your Mom follow along. I’m so glad your Mom is doing better! Love, Lil’ Bella and Lola and family.